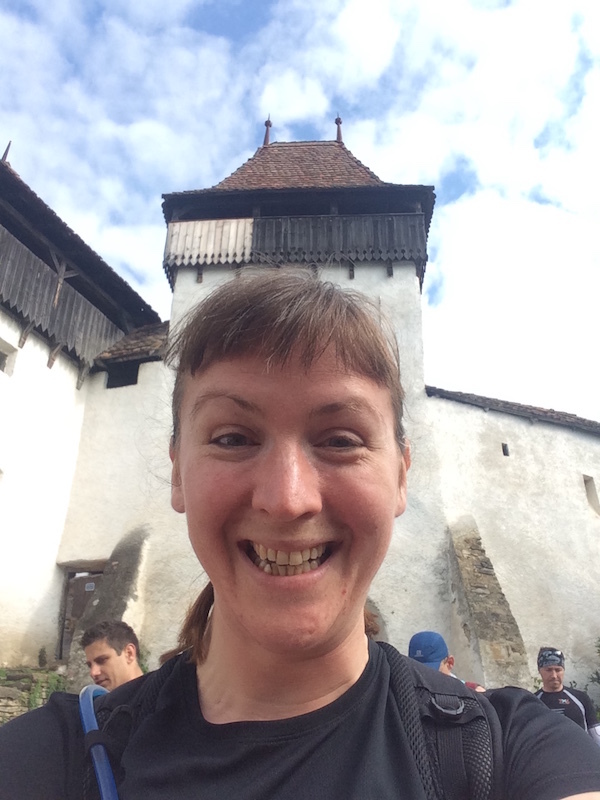 I have never felt more grateful to be on a start line than I did standing in front of the fortified church in Viscri, Transylvania, in Romania on Saturday. 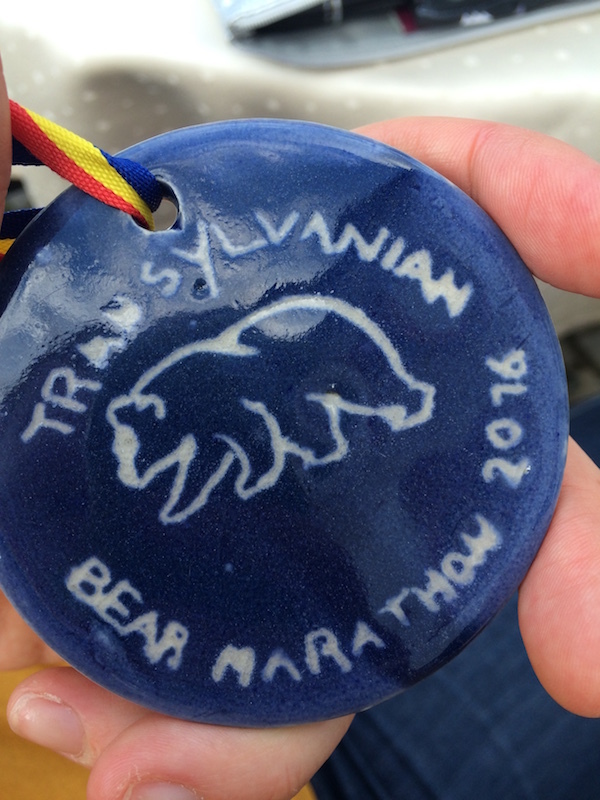 I’d heard about the Transylvanian Bear Race over a year ago when my friend Rhalou ran the first ever one and raved about it, sharing amazing photos and saying it was the best race she’d ever done (and she’s run a lot of races). So I signed up pretty much immediately when it opened up for 2016, and couldn’t stop talking about it for the past 9 months or so. 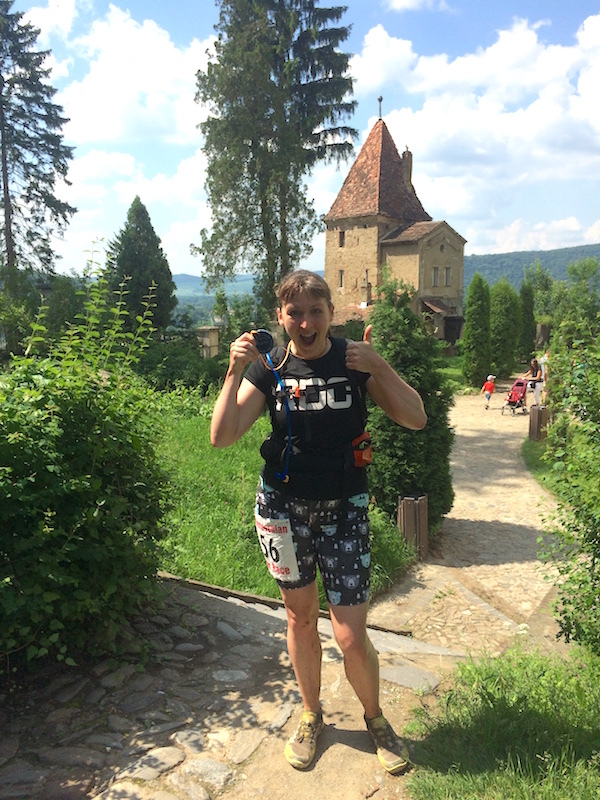 People loved the name and the crazy premise of the race (to run through Europe’s last unspoiled virgin forests, with wild bears and wolves, through medieval villages, and finish going up the steps to Dracula’s castle), and I was excited to finally run my first trail marathon after running five road marathons. For me it’d be both an adventure and a new physical test. But I was quite seriously ill in January, and didn’t really recover enough to do any running whatsoever until April, meaning I had to defer London marathon and DNS Cardiff Half. I managed to party pace Hackney Half in the searing heat, but cramming in 6 weeks of training and only one really long run in for this race was not ideal. 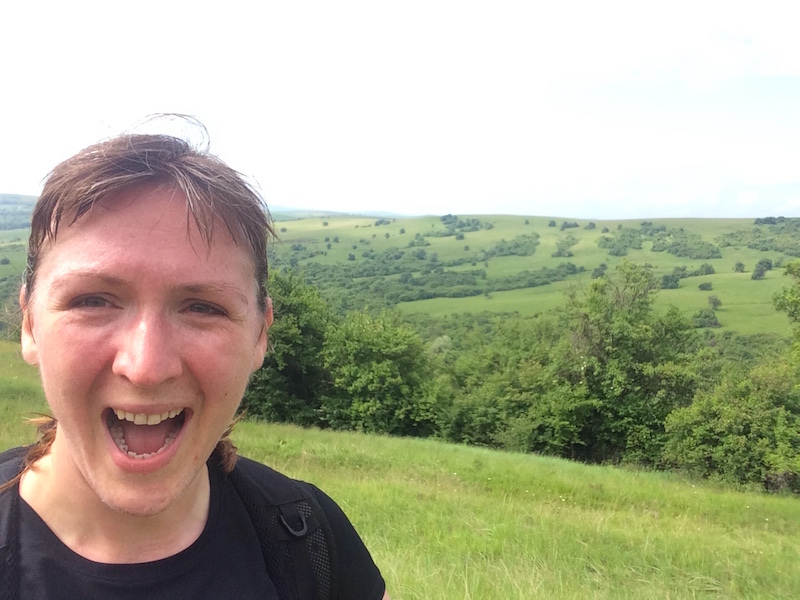 But my 3.5hr run along the North Downs Way gave me confidence that I could at least complete the race, and my legs felt marathon-ready, even though overall I knew I still wasn’t back up to my usual fitness level. 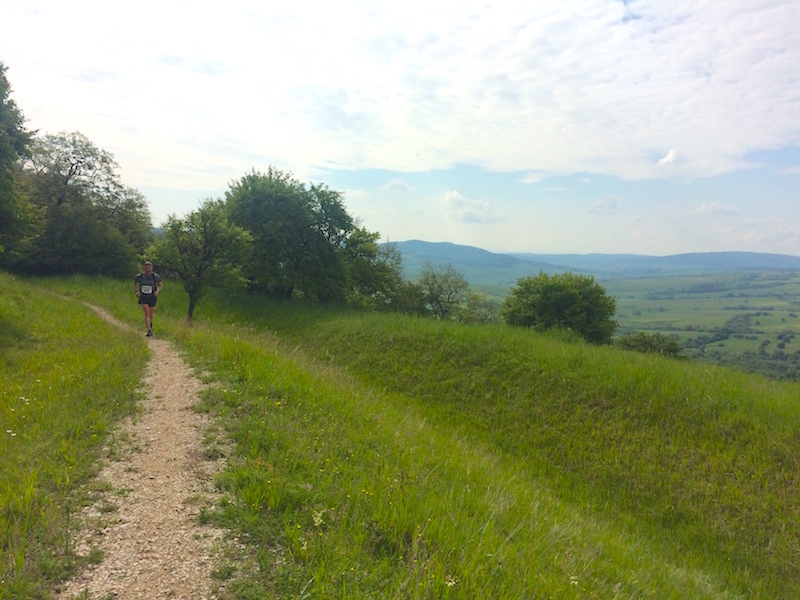 The Transylvanian Bear Race is actually two races – you can choose to run either the “marathon”, or the ultra. 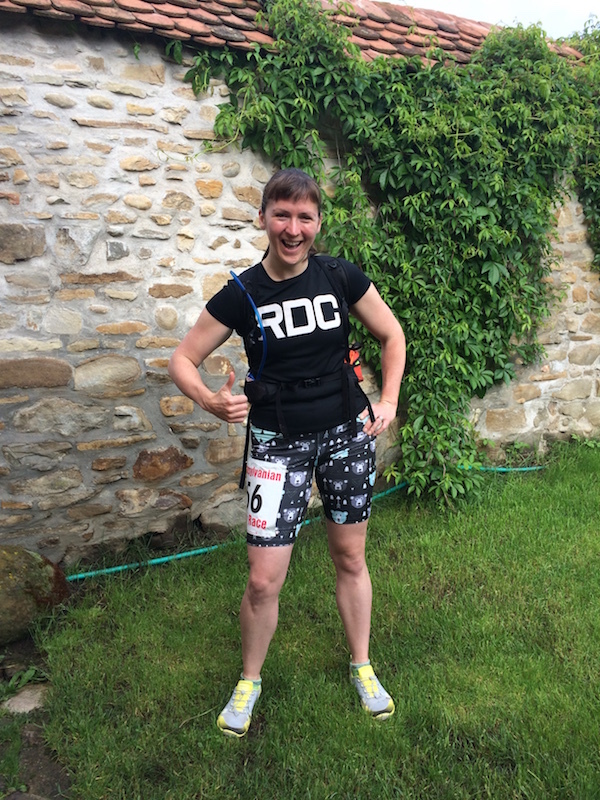 I chose the marathon because I’d been wanting to run a trail marathon for ages, and I credit my staying at a race distance for a number of years before progressing in distance for my only ever having one injury in 14 years of running (from a track session, no less!). So I felt I wanted to stay at the marathon distance a while longer before possibly moving into an ultra at some point – and this ultra is 88km, over twice the marathon distance! I only discovered a month or so before the race that the “marathon” distance was actually 49km the previous year, and as it turned out, 47km this year after cutting out a section through a village. With 576m (1890ft) of climb and challenging terrain, this is not your standard marathon – I’d also learned that last year’s winner finished two hours over his road marathon PB, and that if you get in under 6 hours, you’ve done really well! I stood on the start line feeling ready for adventure, and almost immediately after we took off, we encountered two miles of the boggiest mud I’ve ever seen (and I’ve been to both English cross country meets as well as Glastonbury!). This made it difficult to even walk, let alone run, and I know I used up far too much energy early on just getting through it (as did everyone else). But I was fortunate enough to not lose a shoe (as others did), and when we finally hit the proper trail, it felt amazing to finally stretch out my legs and find a comfortable running rhythm. The vast majority of the race just follows a very well maintained mountain biking trail through the forests – while it was designed for cyclists with nice banked corners and shallow gradients (think zigzags up the hills which runners could easily shortcut), the entire route was lined in a crushed chalk stone which made it easy to follow but also really nice to run on. But there were a few twists and turns along the way, and a few places where it wasn’t immediately obvious which path to take (as there were some logging roads in places, too), and the race directors marked the route with coloured tape at 50m intervals – red and white for the ultra, and black and yellow for the marathon. Talking to other runners afterwards, I seem to be in the minority that didn’t get lost at all, and even in my braindead state at the end, I found it easy to just follow the white chalk path (we were also supplied with an offline trail map app but I didn’t need to use it at all). But those are purely logistics – the experience of the race was both the hardest run I’ve ever done and also the most rewarding. 90% of the route is in the forests, which were just stunningly beautiful. For large stretches of the race I ran alone in the forest, and I could turn 360 degrees around and not only see no other humans, but see no other evidence of humans other than the path. The sound of the cuckoos in the trees while I ran, with dappled sunshine streaming through the forest canopy is a memory I’ll take with me forever. And it was like that, over and over, for hours. We got really lucky with the weather – the forecast in the week leading up to the race called for thunderstorms on the day, and even at the pre-race briefing we were told that waterproofs were mandatory. 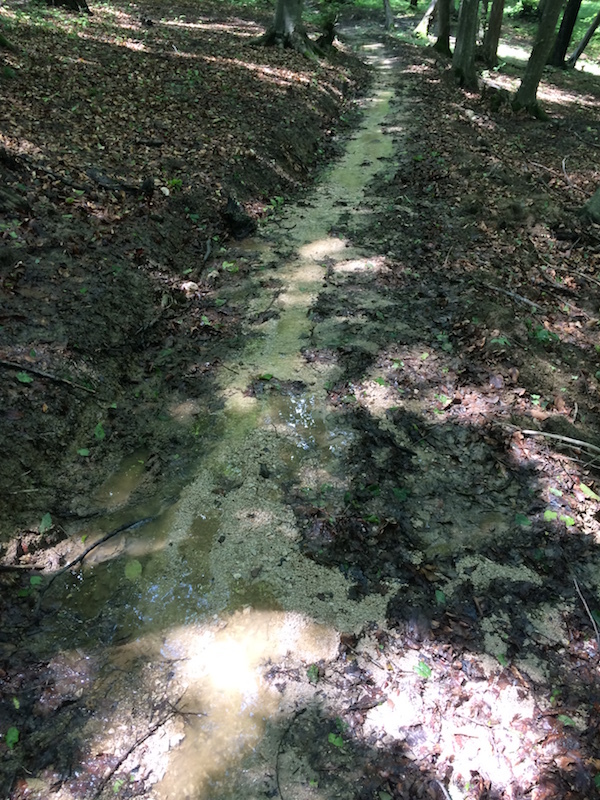 It rained heavily in the days leading up to the race, leaving the path as a near-continuous string of puddles and mud despite the chalk, but the weather during the run was gorgeous – sunny but shaded in the forest and about 20 degrees Celsuis (70F) with a light breeze. The meadows, however, were another story. Apparently only 4km of the course is not in the forest, but as soon you stepped out of the tree line you were hit hard with two things: 1) omg the vistas across the mountains were incredible, stretching for miles and miles fading into faded purple mountains, with no houses or human evidence in sight. And 2) the beating sun caused the temperature to be at least 10 degrees © hotter than in the forest, which, combined with the high humidity, made running a real struggle. 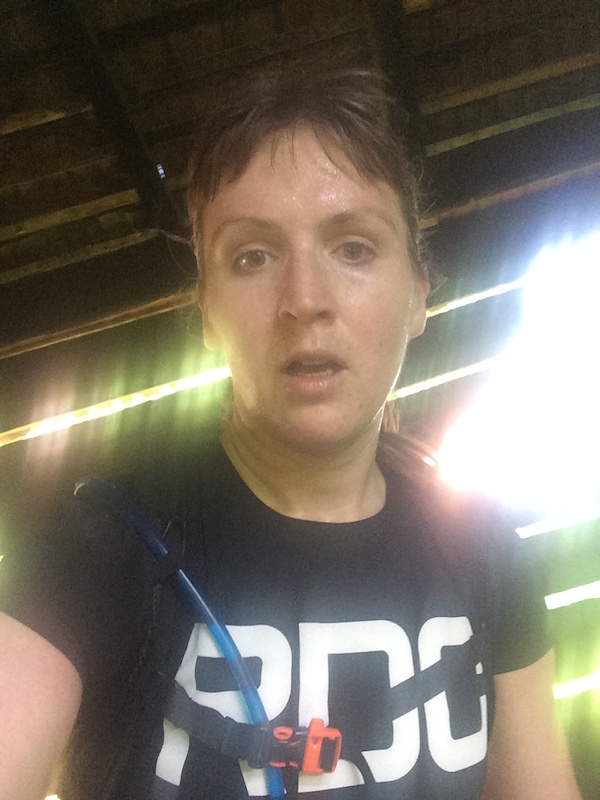 Once the initial boggy miles were out of the way, I settled into a pretty good rhythm in the forests, running about 6min/km (9min/mi), chatting with various other runners for 10-30min at a time, and just stopping at the checkpoints to fill up my Camelbak and be off on my way. 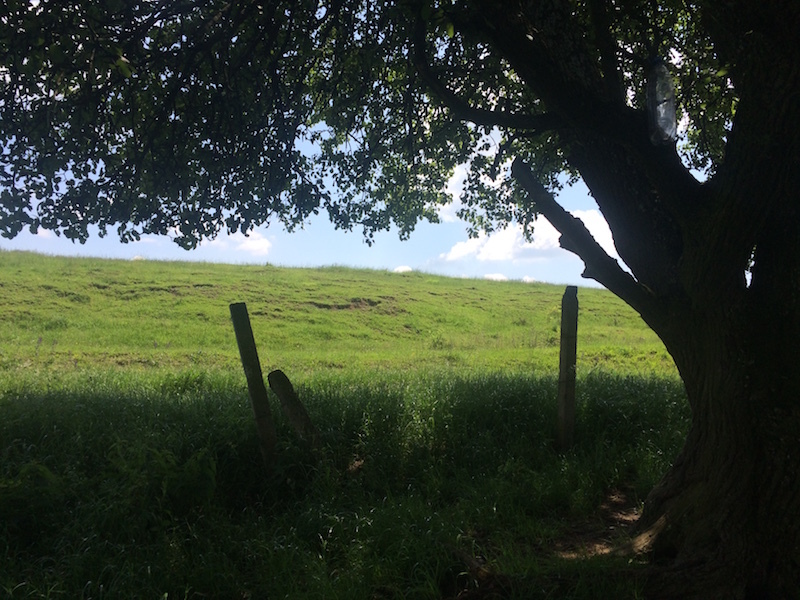 But right after the third checkpoint at 31km (19mi), we hit a meadow and I just melted. I’d already been running for about 4 hours at that point, and every time I attempted to jog a little, but my body just said NO. So to avoid heat exhaustion, I ended up walking the entire 2-3km of that meadow, despite attempting to run several times. This meadow alone easily added 30-40min onto my time, but as soon as I hit the forest again, the cool air hit me and I could pick up running again. Once we were on the mountain biking path, we were pretty much alone until the last descent into town, apart from 2 or 3 weathered local shepherds keeping an eye on their flocks (who’d be warned in advance that we’d be coming through and to kindly keep their enormous sheepdogs out of our way!). Whenever I’ve been on trails or public footpaths in the US or UK, I’d come across people out hiking or walking their dogs, or even out running at least once every half hour or so. But in Transylvania, there wasn’t a soul using the path that wasn’t part of the race, which I just found odd, but also a bit sad. Sure, we were running through a very remote area with only a handful of villages for miles around, but it still felt like somewhere so beautiful should be appreciated a bit more, and not just by 65 sweaty Brits on one day a year. But back to my race – after the molten meadow, I picked back up running again in the forest, but without the same vigour as before. I’m blaming it on the heat, but it could also just be the fact that I’d been running for longer than I’d ever been on my feet before. By the time 5 hours rolled along, I was still a few kilometers shy of the 42km marathon mark, and I “celebrated” by recording a little stream of consciousness video diary on my Go Pro, which was thoroughly amusing but rather rambling so I edited it down for time! The stairs at Sighisoara (actually only half of them! My “acid trip” selfie taken on the stairs – I swear I wasn’t pulling a face, this was just how I felt! 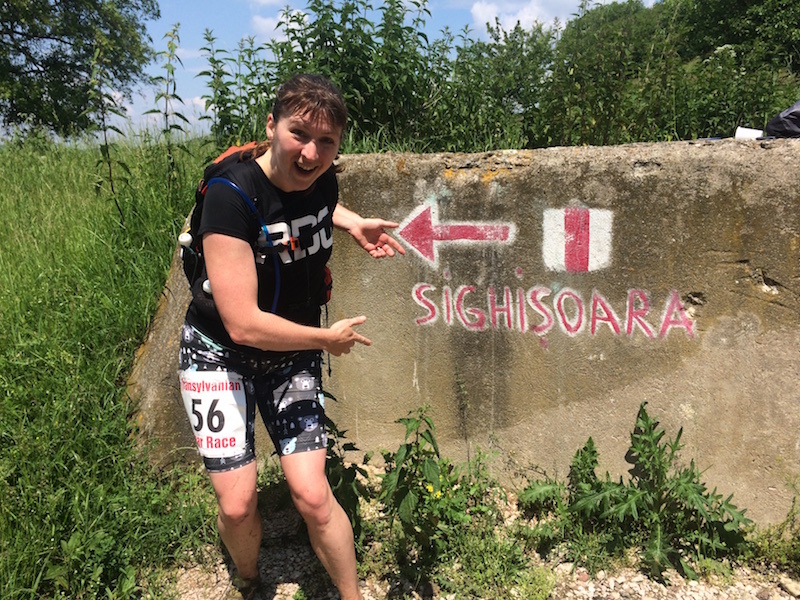 Just before the final zigzag descent into Sighisoara, I started to hear some road noises and another runner came up behind me in one of my walking breaks, so my new friend and I made the descent into town together, feeling equally startled by the sudden appearance of people, taxis, and chickens, and then running on pavement, cobbles, and having to cross the road! Once we got into the main square we were greeted by an almighty cheer from the finished runners enjoying their beers in a piazza cafe, which really helped pick up the legs to get to the almighty covered wooden staircase leading up to the citadel. My new friend started running up the stairs (!! 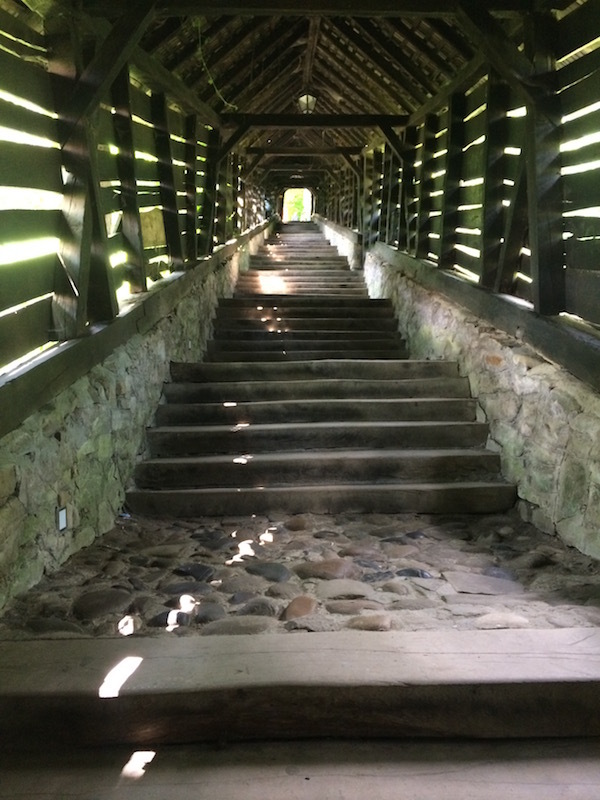 ), to which I promptly said “F— that, I’m walking up!”, then once at the top, it was a short curve round to the very top of the hill, where the finish line was marked with a few stones, cheers of congratulations, and a hug from my friend Ruth (who said I “looked fresh”, hahahah). My official time was 6 hours 22 minutes and 57 seconds, which was about 2.5hrs longer than I’d ever run before (my 3:52 finish at Copenhagen marathon in 2013). I’d also finished as second lady, apparently, too, so in case you’re thinking that this was a really slow time for 47km, just let that sink in (and in fact, my time this year was faster than the first lady’s time last year)! 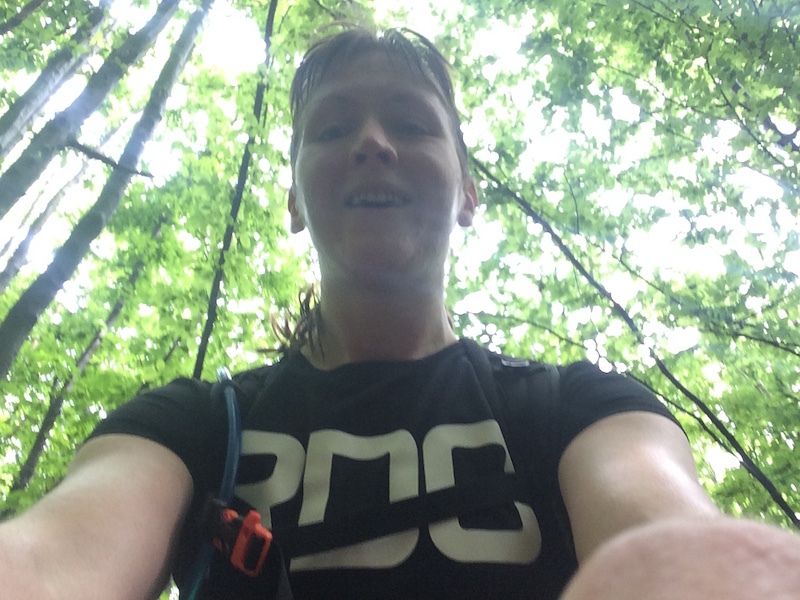 That time is much more of an indication of how difficult the terrain and conditions were than any particular comment on my performance on the day – I know one runner who took nearly 12 hours to finish! 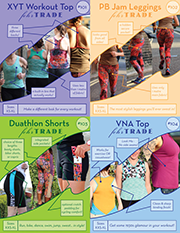 I’m leaving out a lot of race particulars here on purpose as I’m writing another post as a guide for anyone who’d like to run it next year (and you should!! ), but the medal we were given at the finish is probably the nicest one I’ve ever received in all my races. It’s a glazed ceramic medal, handmade by local artisans, and is such a wonderful and fitting reminder of the race – it’s beautiful to behold, but also a little rough around the edges but absolutely bursting with charm. This race was in aid of the European Nature Trust, a small charity whose aims are conservation of the Transylvanian forests through buying up land as well as educating Romanian schoolchildren in a travelling conservation bus. You can donate to my fundraising here if you’d like..
Congrats on a very memorable experience and many many thanks for letting us live some of it vicariously!!! Great write-up. Thanks. I felt exactly the same about the steps at the end.